MakaiPlan is the industry-leading Submarine Cable Route Planning Software that allows users to import and work with all relevant project data in one powerful and versatile GIS platform. Users can create and edit cable routes, define cables and in-line bodies, define and adjust slack, instantly create Route Position Lists (RPL) and Single Line Diagrams (SLD), and create preliminary estimates of cable installation costs. This single software platform provides all the tools necessary for cable route planning and engineering, making the process fast, efficient, and reducing the risk of making critical errors. MakaiPlan allows multiple planners and designers to work collaboratively with easy access to, and exchange of, all project data. MakaiPlan is a Windows-based software with a simple point and click user interface. Users who are familiar with cable route planning can intuitively start planning cable routes with MakaiPlan from day one. Output from MakaiPlan can be imported directly into MakaiPlan Pro and MakaiLay, the latter of which is the world’s most popular at-sea cable installation software, and has been used by over 75% of the global cable ship fleet to install more than 400,000 kilometers since the year 2000. This seamless flow of data along the cable lifecycle, from planning to installation, to repair, gives MakaiPlan users a competitive edge over those who plan their routes using other methods. MakaiPlan takes full advantage of modern GIS to provide access to databases for bathymetry, shorelines, soils, existing cables, survey data, navigational charts, marine protected areas, and any other geographical data relevant to cable route planning. 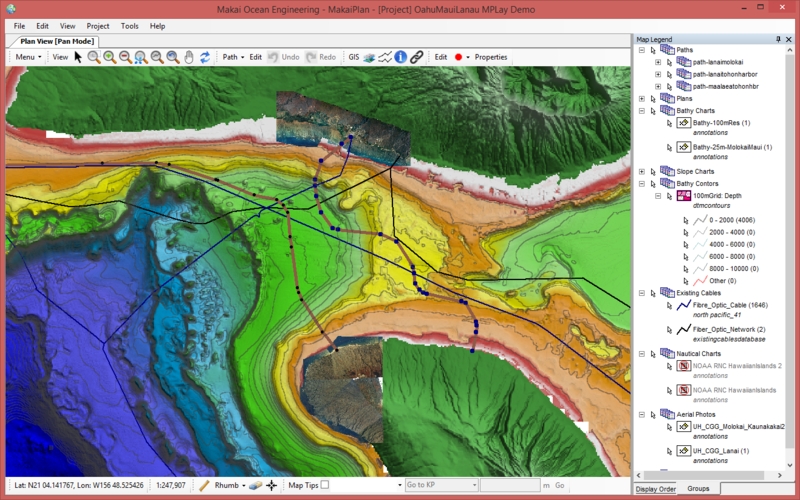 MakaiPlan uses GeoMedia by Intergraph, which has an open file structure and access to a variety of rich GIS databases. 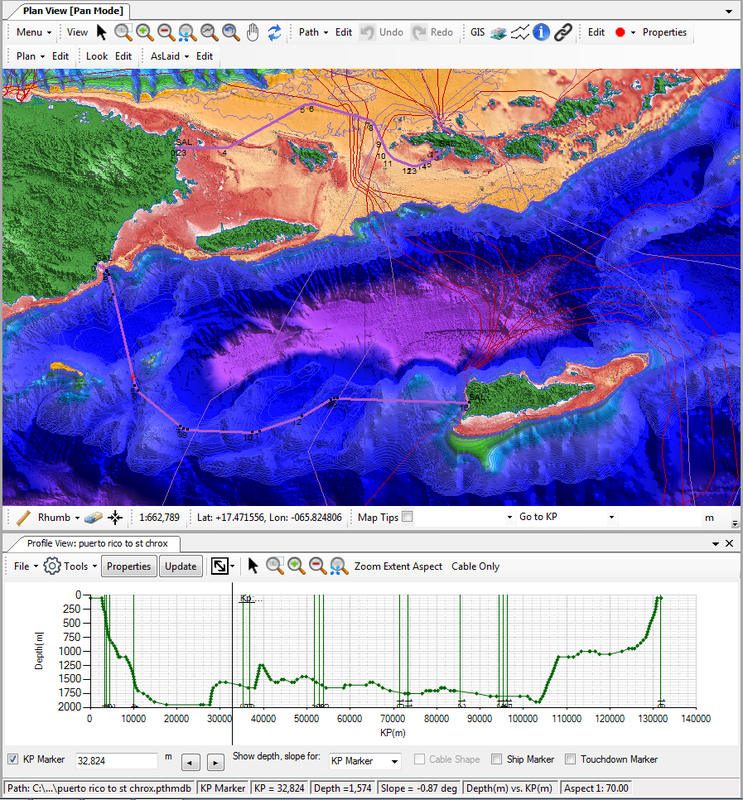 MakaiPlan comes fully equipped with global bathymetry data from GEBCO and World Vector Shoreline data. MakaiPlan can import and properly translate data from other GIS databases in a variety of formats, projections and datums. GIS data is loaded as a layer in a unified plan view where the user can adjust the order and transparency of each layer and can toggle them on and off. Once all the pertinent GIS data are loaded, the user can quickly and easily create cable routes either by point and dragging to the desired locations, by entering precise coordinate points, by importing an existing RPL, or by letting MakaiPlan automatically choose the shortest distance along a great circle route in a series of Rhumb lines. MakaiPlan automatically computes and displays KP route distances and bottom profiles along the cable route based on contour or point data, and generates depth and slope charts. The route can consist of any number of altercourse points, as well as buried sections and special events along the cable. Slack is part of the route definition and both bottom and surface slack are shown. In parallel with route selection, the user can define the cable assembly with cable types, transition points, repeaters, splices, and inline cable bodies. MakaiPlan enables these cable bodies to be precisely located along the route to account for proper distribution of cable slack. Adjustments can be made easily to configure the cable properly. MakaiPlan works in two different modes. Flexible mode (during initial route planning) allows users to alter the cable lengths to achieve desired bottom slack conditions along the route. Fixed mode (after the cable has been manufactured) allows users to fix the cable length so that any changes in the cable route will change the slack rather than the cable length. The real power of MakaiPlan lies in the ease of editing the cable and route information as conditions change throughout the planning and even into the installation process. Editing a route is simply performed by point and drag or precise reentry of data. As additional information is added to the GIS database (e.g., final bathymetric survey, as-loaded cable, cable lay direction or speed), the route and cable can be quickly and accurately updated to accommodate the needed changes. As a result, the plan is interactively created and modified based on the latest available information. As the user makes changes to the route, MakaiPlan automatically computes important route parameters, and the Route Position Lists (RPLs), Single Line Diagrams (SLDs), and bottom profiles are generated and instantly updated. RPLs can be edited further, exported, reversed or split into separate cable lays. SLDs can be displayed, printed or exported. GIS data are loaded into MakaiPlan as multiple layers in a unified view. The user can adjust the order, transparency of each layer and toggle them on and off. MakaiPlan provides a way to view the impact of changes on the holistic cable system, enabling planners to rapidly optimize the route. By zooming and panning along the route in both the plan and profile views, it is a simple task to modify the route such that it avoids obstacles while minimizing cable length. Some potential issues might be more apparent in profile view than in plan view; for example, a steep slope or rough terrain. An option called a dual locator links the profile and plan views of the cable path, so that the user can coordinate edits made in one view with the impact of those changes in the other view. In the same way, it is also possible to link the RPL and Cable Assembly windows in order to coordinate and optimize any changes. Path Crossings: The Path Crossing Locator allows you to automatically identify locations where your cable path crosses other database features such as existing cables in the region, restricted regions, depth contour lines, etc. Once located, the crossing points can be added to the RPL as path points. Define Cables by Depth: The user can define specific cable types that should be used at certain water depths. MakaiPlan will check the entire path and will automatically insert the correct cable types and transitions. Path Buffers: Custom buffer zones can be created around path and cable assembly items. Buffer zones automatically update with path edits to continuously alert the planners about various clearances that should be maintained along the route. For example, buffer zones around the path will move with the path as it is being edited, and continuous alert the planners about the installation corridor. Left: Users can edit routes using plan and profile views simultaneously to quickly identify issues. These views update instantly as the route is edited, enabling planners to see and avoid rough terrain and steep slopes. The KP marker is a dual locator that allows the user to coordinate between the two views. Right: Custom buffer zones can be added around the path and cable assembly items. Buffer zones update automatically with the path edits to continuously alert the planners about various clearances that should be maintained along the route. MakaiPlan can automatically import RPL, Cable Assembly and profile data from text files. 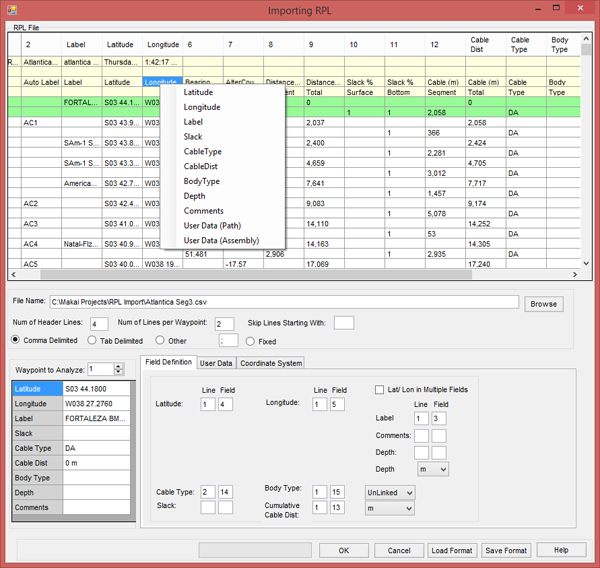 The versatile importing wizard can load text-based data in any format as long as it is structured. The user can then interactively link the various columns and rows to the appropriate fields of data in the wizard. This is a powerful feature that allows MakaiPlan to import required data from a vast number of third party software. MakaiPlan allows the users to add georeferenced points, notes, lines, circles and polygons to the plan view. Notes can have hyperlinks that point to additional information. For example, if there is a restricted area, the user can plot it on plan view and then add a hyperlink to a document that has more information on the restrictions. This information flows seamlessly into MakaiPlan Pro and MakaiLay to improve the quality and richness of data available to the creators of the installation plan as well as the actual cable installers. MakaiPlan has a powerful importing wizard that can load structured text data in any format. A user can define unit costs and preferred laying speeds for each of the cable types and bodies that are being used in the cable assembly. Unit costs for cable installation such as vessel costs, burial costs, and any special events can also be included. Based on this information, preliminary installation cost for a given cable route can be estimated. As the route is modified, these costs are automatically updated. MakaiPlan contains tools to split, merge and reverse the cable path as needed. MakaiPlan has a powerful importing wizard that can load structured text data in any format. This allows for a long path to be broken into sections that can then be developed independently by separate planners. There are also version control options for the path, which automatically track edits that are being made to the path. The user has the option to instantly revert to any of the past revisions, which is particularly useful when working with long and tedious paths with several competing constraints. Once the cable route and assembly is finalized, there are several options to export the data into tables, Single Line Diagrams, KML files to display on Google Earth, AutoCAD files, and more. As previously noted, a MakaiPlan file can be directly opened with MakaiPlan Pro and MakaiLay, making the job of the cable engineer in the next stage of the process easier and more information rich.